Back in November I adopted Ariel with my Shoppe Sugar Cookie Etsy earnings. Ariel is a manatee who lives at Homosassa Springs Wildlife State Park in Florida. 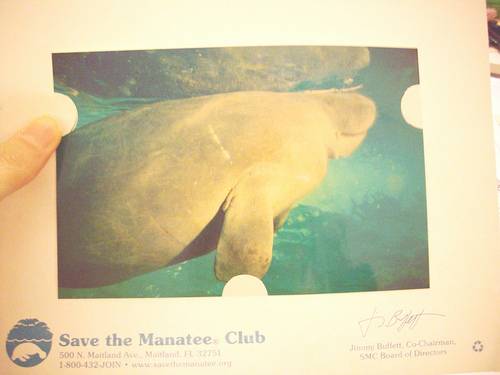 I love the updates I get from Save the Manatee Club. It is like getting a letter from Ariel! The last update I got Ariel sent a Valentine. Please think about adopting a manatee for a loved on this Valentine’s Day! This entry was written by sistermissy, posted on January 26, 2009 at 8:54 pm, filed under Athens and tagged Etsy, manatees, Valentine's Day. Bookmark the permalink. Follow any comments here with the RSS feed for this post. Post a comment or leave a trackback: Trackback URL.